The NTA (National Testing Agency) will do a NET (National Eligibility Test) in June this year. 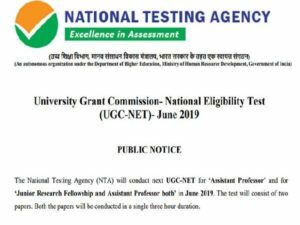 The UGC Net exam is done to see if a candidate is eligible for JRF (Junior Research Fellowship) or Assistant Professor. The UGC NET exam that happened last year in December was actually the first NET exam that was helmed by the National Testing Agency. An announcement was made by the NAT and said that the next NTA NET Exam will be in June 2019. The UGC NET exam that will happen in June 2019 will be a computer-based exam. There will be two papers, the first paper will be a test teaching paper and research aptitude, the second paper will be a test that will subject-specific knowledge. These two papers will be conducted in a single sitting three-hour exam session. The beginning dates of downloading their admit cards will start on May 15, 2019. The exam will happen on multiple dates that include June 20, 21, 24, 25, 26, 27, and 28. After the examination will be finished, the NTA is set to release a provisional answer key that will allow candidates of the exams to send their objections regarding the exam answers. Note: The NTA is set to release the result of the NTA NET exam by July 9, 2019.